quoted from it prove. An example culled from its pages proves its European origin: The cure for blood stopping of a wound is wrapping up and laying away the injuring instrument. This is concurrent with Old World practises. [sic] In [title underlined] The Golden Bough by Sir James Frazer under the chapter on Homoeopathic Magic, this practise is commented on. I found my information on the Black Book in [title underlined] South Mountain Magic by Madeleine Dahlgren, published by James R. Osgood & Co., Boston, 1882, chapter seven of the book. I never had a copy of Zittle's book, nor saw it, nor know of anyone else that had seen it other than the authoress, Dahlgren. I feel definitely sure that it is no fake; Mrs. Dahlgren's style of writing would totally eliminate her from the brilliant conception of so highly imaginative and daring an idea. In other words, when the reader takes into consideration the unimaginative, Victorian period that she lived in, plus the obvious unevenness of her writing, he would not attribute such a narration of facts to be born of her pen. The apotheosis of shunned and terrible tracts is, of course, the [title underlined] Necronomicon, fictitiously created by Lovecraft, and his other imaginary tomes and writings such as the Pnakotic Manuscripts and the R'lyeh text. Curious indeed is the history Lovecraft composed around the [title underlined] Necronomicon. It also has a varied journey through many lands. H.P.L. recounts partly that the [title underlined] Necronomicon was translated in both the German and Spanish. Now the black book of Michael Zittle was "translated from the Spanish into the German". It is possible that Lovecraft might have read [title underlined] South Mountain Magic and been influenced by the concept of a "conjuring book." His library, I understand, was very extensive. I would be very much interested if I could in some way obtain permission to examine his library and if nothing else at least make note of every volume therein. The fruit of such labor would be a quasi-definite idea of his background for some of his stories and Cthulhu mythos. Of the present day pseudo-"magical" books much is already known so that any discussion of them would be superfluous and repetitious. This does not imply that all forbidden, occult tracts are known to us. For instance, there is the [title underlined] Black Book of the Baschkirs, of which I have little knowledge, save that curiously enough it is supposed to descend only by choice to each successive owner with all powers conferred. [text inside box. 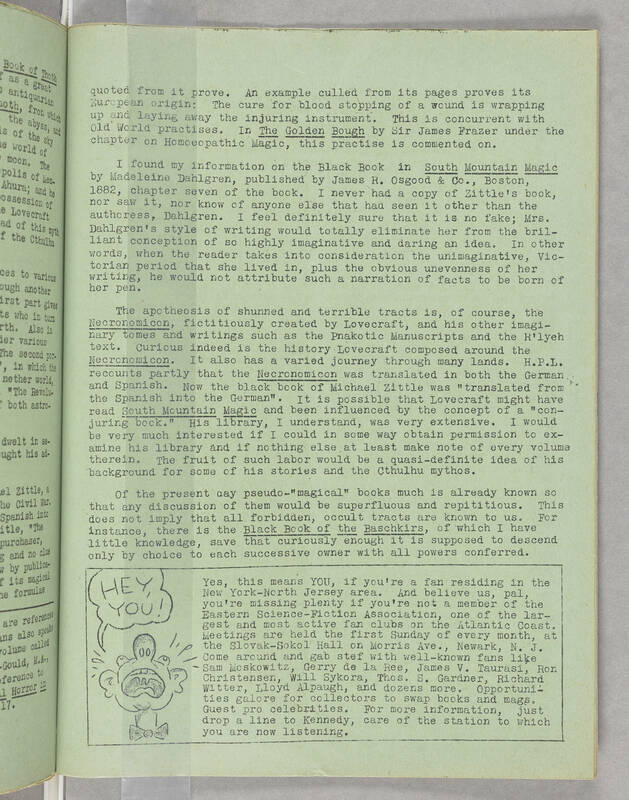 Illustration on the left side of text with a man yelling, "Hey, You!"] Yes, this means YOU, if you're a fan residing in the New York-North Jersey area. And believe us, pal, you're missing plenty if you're not a member of the Eastern Science-Fiction Association, one of the largest and most active fan clubs on the Atlantic Coast. Meetings are held the first Sunday of every month, at the Slovak-Sokol Hall on Morris Ave., Newark, N. J. Come around and gab stef with well-known fans like Sam Moskowitz, Gerry de la Ree, James V. Taurasi, Ron Christensen, Will Sykora, Thos. S. Gardner, Richard Witter, Lloyd Alpaugh, and dozens more. Opportunities galore for collectors to swap books and mags. Guest pro celebrities. For more information, just drop a line to Kennedy, care of the station to which you are now listening.